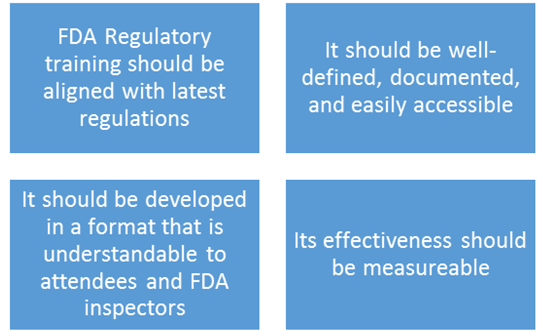 Why FDA Regulatory compliance training? All FDA regulated companies must ensure compliance with FDA regulations. The number of FDA regulations and their complexity is growing steadily over the years. The risk of noncompliance for companies is too high. To ensure compliance with the ever evolving regulations and to mitigate risk, organizations must proactively find ways to efficiently train their employees to comply. 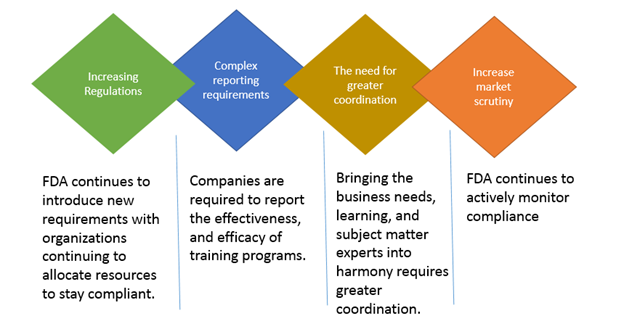 The following figure illustrates the importance of FDA training in ensuring organization-wide regulatory compliance. What are compliance training systems? A FDA regulated company can offer training to its employees in-house or can enroll employees in external training programs. Regulatory training programs cover a wide range of topics including Risk Management, Packaging and Labeling, FDA Audit and Inspection, Drug and Device Approvals, FDA Validation, FDA 21 CFR Part 11, Marketing and Promotion, Documentation and IT, Quality and Safety, Regulations & Guidance, Best Practices & GXPs and more. Training formats include seminars, webinars, onsite seminars, and others. What are the key attributes of effective compliance training programs? In planning a training program, it is important for the relevant staff to determine if the training program is aligned with the current FDA regulations. If the content is outdated, it could lead to regulatory violation. By reviewing the syllabus of the training with attention to every detail, you can determine if it is aligned with the latest FDA regulations. If you are enrolling for an external training, carefully review the overview of what will be covered in the program. Defining and documenting the training is a compliance requirement. Failure to document procedures is one of the most common violations for which the FDA issues warning letters. However, maintaining documentation in paper formats makes accessibility difficult. Having a relevant infrastructure and technology can simplify accessibility. The training program must be developed in a format that is understandable to those who undergo the training and to the FDA inspectors. If the effectiveness of the training is compromised due to its format, the FDA Inspectors are more likely to issue warning letters. The procedural standards must be effectively delivered through the training program. Examples of training content includes: Procedures for vendor management and outsourced facilities, procedures for monitoring of quality of ingredients, procedures for accepting or rejecting ingredients and more. Finally, measuring the effectiveness of training programs can take many forms. However, the ultimate result should be data that can be shared with FDA and the leadership. Define specific key measurement metrics that can be aimed at to change as a result of training. Tie in compliance learning into the culture of the company to demonstrate that the efficacy may go beyond the qualitative measures. Make use of knowledge and behavioral assessments to demonstrate retention of knowledge over time and application of the job. By ensuring recency, relevancy, accessibility, and understandability of the compliance training programs provided to the employees, organizations can increase compliance with regulations, and mitigate risk. How can organizations create a culture of compliance? 'Training and communication' are the keys to developing a culture of compliance across the organization. As regulatory expectations continue to increase, let compliance take the front seat. Gone are the days when compliance was a back-office function. With the steady increase in the number of enforcements today, compliance has taken the front-seat. The fact is this - Having policies, practices, and procedures in place will hardly make sense if they are poorly understood and implemented. They do not result in changing the behavior of the organization. Training provides a solid foundation towards establishing effective compliance across the organization. Training is the means for organizations to communicate their message, let employees know what is expected of them and teach them how to escalate and respond to a situation. On the other hand, failing to invest in training can escalate costs associated with external recruitments, high financial penalties for individual and corporate violations. What are the regulatory compliance training options available? We have understood the FDA regulatory training needs of organizations and have brought together the Ex-FDA officials and subject matter experts. The training modules created by them cover real-life scenarios and the webinars are made accessible on ComplianceOnline platform. These training programs are designed to help organizations comply with regulatory requirements while creating and building awareness about it amongst your employees. By implementing the knowledge provided at these training programs can equip employees prevent fraud, violations, and misconduct that they may come across. Our training programs offer organizations the flexibility to choose programs by industry and role. You can also acquire recorded CDS, and read our web-based modules and resources. New webinars and seminars are included regularly, and the courses are available for individuals and groups based on the kind of package purchased. Every year, hundreds of FDA regulated organizations rely on ComplianceOnline to train their employees in the latest FDA regulations. Join them.